Here is the poster from Sony Pictures Classics’ upcoming film “Whiplash” The film is directed by Damien Chazelle, starring Miles Teller, J.K. Simmons, Melissa Benoist, Paul Reiser, Austin Stowell, Nate Lang, Max Kasch, Damon Gupton. 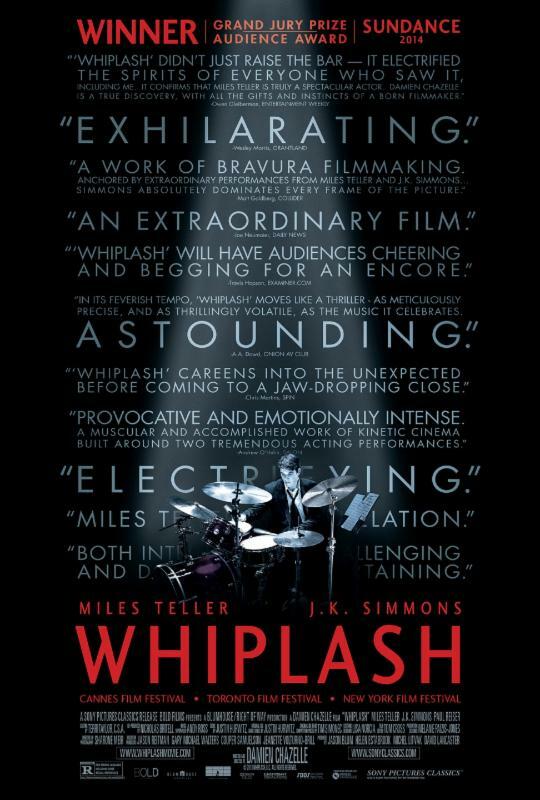 WHIPLASH In theaters October 10, 2014! Here is the trailer from Sony Pictures Classics’ upcoming film “Whiplash” The film is directed by Damien Chazelle, starring Miles Teller, J.K. Simmons, Melissa Benoist, Paul Reiser, Austin Stowell, Nate Lang, Max Kasch, Damon Gupton. Andrew Neyman is a 19-year-old jazz drummer, dreaming of greatness but unsure if his dream will ever come true. Haunted by the failed writing career of his father, Andrew is determined to rise to the top of the country’s most elite music conservatory. One night, Terence Fletcher, a conductor equally known for his talent for teaching as he is for the terrifying method of his instruction, discovers Andrew practicing the drums. Even though Fletcher says very little to him that night, he ignites in Andrew a passion to achieve his goal. To Andrew’s surprise, the next day, Fletcher requests that he be transferred into his band. This single act changes the young man’s life forever. Emboldened by this acceptance, Andrew summons the courage to ask out Nicole, the counter girl at his local theater for whom he’d nursed a silent and unrequited crush. But on that date, Andrew’s musical preoccupations threaten to derail even his most genuine romantic overtures. Andrew’s maniacal effort to achieve perfection is further fueled by Fletcher’s psychological brinksmanship. Andrew’s family can barely recognize the stone-faced obsessive sitting at their dinner table. Andrew even elicits a sharp word from his otherwise mild-mannered father. The nearer to perfection Andrew gets, the narrower his circle of intimates becomes until he is left only with Fletcher — and even that relationship is jeopardized by the ferocity of Andrew’s ambitions. A journey that can be seen alternately as a descent into madness or an ascent to greatness comes to a crescendo on the biggest platform for Andrew’s talents — the unforgiving stage of Carnegie Hall.